Challenge is a world-wide premier manufacturer of heavy-duty and high-quality equipment, and their Handy-Drill is no exception. 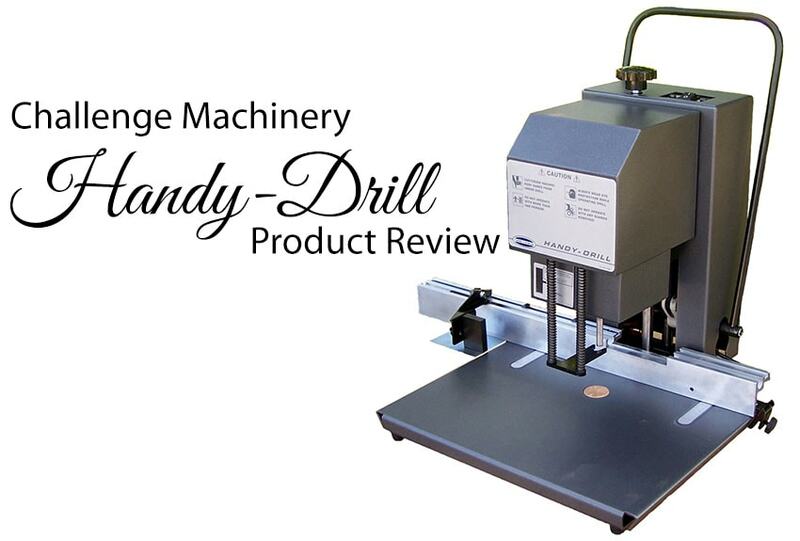 The Challenge Handy-Drill Paper Drill was designed to bring speed and efficiency to quick-print and on-demand operations. Featuring a hand lever drilling operation, a manual trip side guide and a heavy duty metal table, the Handy-Drill is a highly efficient and productive drilling machine. The Single Spindle motor automatically turns on when the pull-down lever is moved and automatically switches off when the lever returns to the up position. Located around the spindle, the chip collector cups include a sight gauge to signify when the cups are full and need to be emptied. The cups also serve as safety covers with interlock switches. When removed to change the drill bit or to empty the paper chips, power to the motor is locked out until the cups are replaced. The back gauge includes 4 adjustable stops for drilling multiple hole pattern jobs; just flip the switch and move your pile to the next setting. The Challenge Hand-Drill features a 2 ½" lift capacity in 4 different drill bit sizes (1/4”, 5/16”, 3/8”, 1/2"). It is also available in model featuring a 2” maximum lift capacity for a wider range of available hole sizes (1/8” to 1/2"). The Handy-Drill is extremely safe to operate; its spindle motor automatically turns on when the pull-down lever is moved and automatically switches off when the lever returns to the up position. The conveniently located chip collector cups are located around the spindle and they include a sight gauge to signify when the cups are full and need to be emptied. The Challenge handy-Drill was manufactured in the U.S.A.
Paper drills are typically used for binding purposes, by drilling precise holes into thicker stacks of paper that are too difficult to punch by hand. The paper stack is then typically bound by using paper fasteners, binders, screw posts, or binding rings. Paper Drilling Machines are most commonly used by schools, print shops, binderies, & paper manufacturers. Paper drills are designed to quickly and easily drill different diameter holes in thick stacks of paper. Depending on the model of paper drill that you choose, you can drill one or more holes at a time through up to a 2" thick stack of paper. Manual paper drills work much like a drill press and require you to pull down the handle to drill through the paper. Electric paper drills automate that process by drilling through the paper automatically, usually activated by a push-button or foot pedal. A selection of other paper drills and accessories are available for most drills, including drill blocks, lubricant, drill bit sharpeners and additional drill bits of different diameters.